Thomas Dudson? 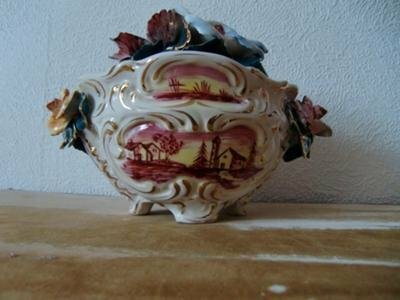 Ornate Antique China Floral Trinket:- Hello Peter! I wonder if this bowl could be a Dudson. Width is about 20-23 cm and hight about 15 cm. I bought it this last autumn in a shop run by the Salvation Army in Stockholm Sweden. Many thanks for submitting, but you have confused me on so many levels, I don't know where to start. Dudson wares were often unmarked in their early period 1800 - 1888 (James Dudson - official founding date is 1838). Then from 1888 they were marked with J Dudson England. Then from 1898 as Dudson Brothers, England. And then from 1945 Dudson, Hanley. Today they have several marks and brands. The second thing to say is where do you get 'Thomas Dudson' from? I don't know of a time period when they were named Thomas Dudson. I am sure there were members of the family called Thomas, but I don't know of any separate companies of that name. Perhaps you can enlighten. ago ensured their survival today - namely by specialising in stylish, hard-wearing hospitality ware (hotels and restaurants). 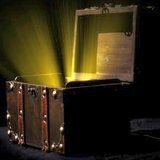 So for you show me a trinket box with floral decoration and say "Thomas Dudson" has completely thrown me, I am afraid, so perhaps you could enlighten.... 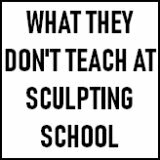 I am sure you must know something I don't, and that is what this website is all about - each of us sharing their knowledge. In fact, I believe Dudsons are by far the oldest and longest surviving family owned ceramic makers in the UK. I have had the pleasure of meeting Mr. Ian Dudson (CBE DL) who is also, incidentally, the High Sheriff of Staffordshire and a fellow member of the Staffordshire regeneration initiative. With the towns of Stoke-on-Trent nowadays looking like London after the blitz, so many are the factory closures and so sweeping the works of the bulldozers, it comes as a very pleasant surprise to know there are still some beautiful old ceramic companies which have survived the economic turmoil, the Far East under-cutters and the general downturn in demand for fine china. Dudsons is most certainly one of the few. Check out their website which is very informative. I'm sorry my writing on the subject was a little bit sloppy the first time above. There are paintings on all four sides of the trinket. four-leaf clover and is placed at the inside of one of the four foots. Beside it there is also an uneven X that looks like being scratched in by hand. 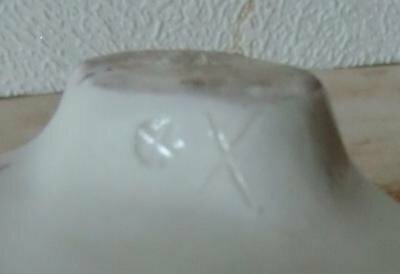 The mark is described "Dudson,Thomas". I also wish to thank you for the link to the Dudson Company site. Here is mentioned a James Thomas. 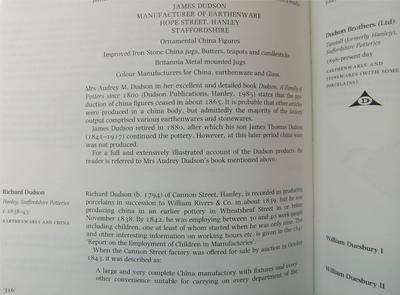 "On the death of his father in 1882, James Thomas Dudson, the great grandson of the founder, became the owner of the Hope Street factory..."
Here is a couple of links mentioning the Dudson Company. Many thanks for your additional comments. We will come to the answer to this mini-mystery sooner or later! I tried to research Thomas Dudson more in my Goddens encyclopaedia, but they don't really mention this name, and they don't mention the early period from 1800. However, I read on potteries.org that "Thomas Dudson ran the new Hope Street works from 1809-1838". So maybe this is a clue to who Thomas Dudson is, but the company themselves do not mention him on their potted history page. The Marks Finder website you mentioned I am familiar with but, as you say they charge for access now, so I haven't visited for a while. Their information on English makers was normally not as comprehensive as Goddens anyway - except in this case it seems. Let me know if this looks anything like it. The thing is, if this mark is that of Thomas Dudson from the Hope Street works 1809 - 1838 then this must be a very old item dating from that time. However, only an expert could tell. So hopefully, someone will help out, or otherwise I have an expert referral service available. Hello again Peter and thank's for your answer. As for your question wether the mark you present looks like the mark om my trinket the answer is no. As for the mark on my trinket it shows very clearly on your site now if you click the picture. Following our Dudson discussions above about a trinket that I thought was made by someone from the Dudson family. 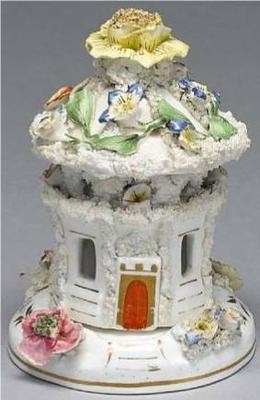 A Dudson Summer house pastille burner and stand, circa 1830 of circular panelled form the edges applied with extruded clay and pierced with evenly spaced windows, the roof applied with a large yellow flower finial bordered by trailing flowers, the whole applied with further flowers 16 cm (minor losses to flowers, minor wear to gilding)"
The flowers of the object in the auction look not very different from the flowers on my trinket/lidded terrine. But maybe my is something Italian with the flowers looking like they can be something from like Bassano. I will also submit a picture of text from a book. I am sorry to say I have not made much further research about the famous pottery family Dudson. I tried to find the above mentioned book,Dudson. A family of Potters since 1800, on a couple of libraries. Will possible make some further efforts in the future because I am a little bit "pottery struck". Maybe far reached, but just like in music you can in handicrafts you like experience something more than just the subject. The beauty of it. I very much appreciate your research on the old Dudson wares. Great contributions which enrich the knowledge of the internet! Keep them coming. 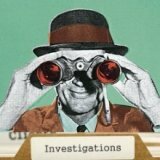 You will always have an outlet for your research and writing here. Return to Antique China and Fine China Collectibles.